I write in a haze of codeine and steroids. I have a cough, and have had one long enough that I finally went to have it checked. A little concerned as he listened to my lungs, my doctor made me promise to take the meds. More importantly I vowed to rest. Yeah. Easier said than done. I hate being sick. Honestly, I can’t imagine that anyone truly enjoys it. Well, maybe those people with Munchausen syndrome do (Google it! ), but only people on Lifetime even have that, right? When we’re under the weather, we have to miss activities, push things aside, and sit still. I’m not good at that. It’s especially hard at this time of year, when the calendar is completely overbooked. I’d so much rather be at The Kids’ school helping out, playing tennis, Christmas shopping, or anything but sitting here getting better. Life doesn’t stop when parents are sick, you know? The kids still need to be fed. Someone has to take them to school. I can’t just stick them in the yard with a bowl of water and hope for the best. Don’t get me wrong, The Man helps. Unless he is sick. And today, he came home sick. He walked in the door, announced a belly ache, and went straight to bed. At the time, I didn’t think of the ramifications, so I said, “ok!” As I thought about it, as clearly as I could while drugged, I realized that I needed to write my column and make dinner. Homework needed supervision. The Kids needed after school attention and snacks. Regroup! I believe that he feels ill, I really do. I just wish I’d been the one to call dibs on bedtime first. 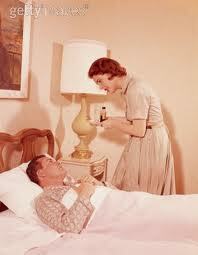 Men fall easily when sick, don’t they? If The Kids get a cold, they may miss school, but they still play in the yard, eat dinner, and otherwise act like they normally do. The coughs that emanate from men with colds seem to be horrible, deadly coughs, because of which a lung could collapse at any time. They are bedridden, and a cold somehow seems like the plague. They need to sleep it off, unable to complete any major (or minor!) tasks. Call the CDC! Face it, Man Colds are different. That’s what they’d like us to believe, anyway. I mean, if The Kids survived, and Mama survived, why is Daddy ailing so? Do we need to call the waaaaaaaaaambulance? Sheesh. I don’t think he’d suggest calling to prearrange his funeral. He just needs rest, and so do I. After my next dose of meds, we’re both going to bed. Besides, there’s a big jar of pickles in the fridge, and a loaf of bread in the pantry. I think the milk is still good. The laundry is all clean, and we have plenty of toothpaste. The Kids will be fine. They can’t drive, though. Does Summerville Ace (or any other package store) deliver?